1. SAGEBRUSH TOM (1915) Tom Mix, Goldie Colwell. Lots of great fun and action as cowboy Tom falls in love with an actress with disastrous results. 2. 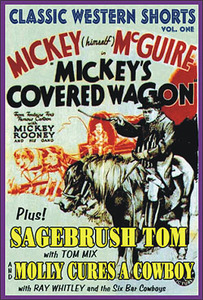 MICKEY’S COVERED WAGON (1933) Mickey (Rooney) McGuire, Billy Barty. Mickey and his kid pals travel west to find gold, but get diverted by excitement in a haunted house! This would NOT pass the PC test today. 3. MOLLY CURES A COWBOY (1940) Ray Whitley, Hank Worden. Passable fluff about a middle-aged lady and a villainous doctor, but lots of great Ray Whitley songs! From 16mm.